Heavy Duty system features 16-guage solid shelves. Large 1-5/8 (41mm) diameter posts and 2" (51mm) shelf adjustability. 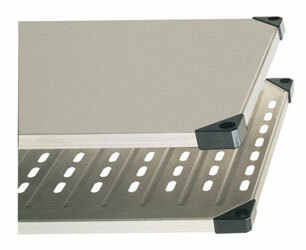 Shelf options include flat or louvered/embossed styles, and galvanized or stainless steel finishes. Stainless solid shelving has black powder-coated corners. Galvanized solid shelving has uncoated cast corners. HD Super shelves, posts, and casters are not compatible with Super Erecta or Super Adjustable Super Erecta components.